We looked into our beer crystal ball and we see something tall, dark, and barrel-aged in your future. Barrel-Aged Ten FIDY Imperial Stout is back in 2018 with taproom events on November 3, followed by national distribution on draft and in 19.2oz stovepipe cans. 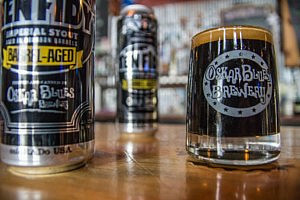 Oskar Blues Brewery stuffed Ten FIDY Imperial Stout into bourbon barrels for a minimum of eight months; allowing vanilla, oak, and bourbon flavors to permeate the pitch-black depths of FIDY. During maturation, the FIDY-plus-bourbon flavors mellow into a cool, drinkable, deeply complex brew. Next, we asked the crystal ball what to pair Barrel-Aged Ten FIDY Imperial Stout with. When we peered inside, we saw autumn days, football games, gatherings of friends, fireplaces, hearty stews and chilis, and decadent desserts. No, it didn’t mention anything about your dating life – sorry. Can’t make it to a release event? That’s okay – BA Ten FIDY Imperial Stout will be nationally distributed following the November 3 release. No need for a crystal ball or a psychic hotline to find it – track it down via the handy beerfinder.